1 Allow the strawberries to thaw slightly. 2 Drain the canned fruit. 3 Combine all the fruit; blend in a blender or food processor in small batches. 4 Add the yogourt to the blended fruit. 5 Serve in cups; top with a sprinkle of Grape-Nuts® or a few frozen blueberries. Tip: Smoothies are a great way to increase fruit and dairy intakes. Substitute with any frozen fruit you may have on hand; leftover frozen bananas can be substituted for the pineapple. 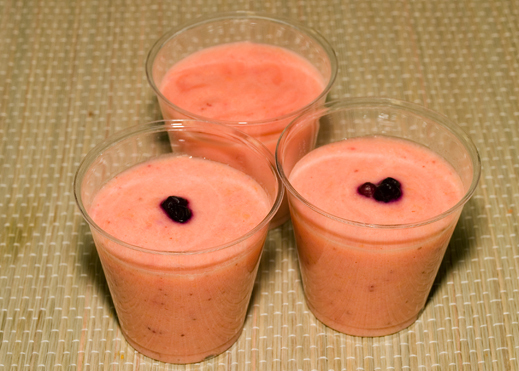 Smoothies made with frozen fruit may be a little thicker than those made with fresh fruit. If required, thin the mixture by adding some of the liquid drained from the fruit. The flavour combinations of smoothies are endless; experiment a little and have fun. • are very popular fruit, particularly in Nova Scotia, where we consume more strawberries per capita than any other region of Canada. • are grown in every province in Canada and that new varieties mean they are available fresh for a longer period of time? • have a museum dedicated to them in Belgium? • are best plump, bright and red, with fresh green caps. • don’t ripen after picking, so avoid berries that have white or green parts. Leaving the green cap on will help them stay fresh longer.